The Titanic Hotel at Stanley Dock in Liverpool has been open for a while and reviews are coming in. Teresa Machan writing for the travel section of Daily Telegraph gave it high marks. She liked the style and character of the place, the service, the rooms and value for money. Her major ding is its location, the Stanley Dock, which is not exactly a place one finds classy hotels in Liverpool. So it got the lowest mark of 6 out 10. And the service would have been a 9 had not a waiter spilled milk when picking up her breakfast bowl. Otherwise she considers it worth the trip. 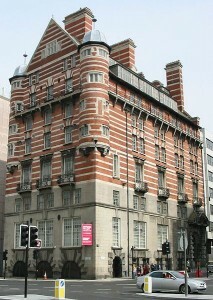 The website for the hotel is http://www.titanichotelliverpool.com/. 1. 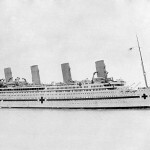 David Reynolds, age 55, decided to do something to commemorate HMHS Brittanic, Titanic’s sister ship that served in World War I. So he made a matchstick model comprised of 50,000 matchsticks, glue, varnish to build his 5 foot model. And it looks pretty good from the picture in the news article. It took him 700 hours to build the model, which is radio-controlled and water tested. He has built matchstick models before. His 23 foot tall oil rig “Cathedrals of the Sea” is at the Ripley’s Believe It or Not! museum in Florida and a world record for the largest matchstick structure. The article does not reveal what he plans to do with the completed model. 2. 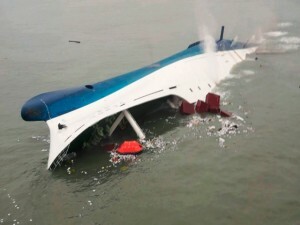 As we learn more about the sinking of the South Korean ferry more sad stories are emerging about its final moments. The ferry had lots of school students aboard and footage from cell phones are know surfacing, In one the kids, who do not know how dire the situation was, were heard to say ‘This is like Titanic.’ Cries of desperation are also heard in kids saying they did not want to die, this looks like the end, or asking to call mom. More harrowing are images of an arm banging on glass to get the attention of rescuers and then sadly the ferry sinks out of range of the rescuers leaving the trapped to their doom. The footage is now part of the official investigation as to what happened. The captain has been detained and facing charges as are several crew members. Two employees of the ferry’s owner have also been detained. And now we learn that there were structural issues as well. Another ship captain warned of the instability caused by adding more cabins to the ferry. All in all, this is a major screw-up and preventable tragedy. Out of 476 passengers, 174 survived. 2 crew members also perished. 3. 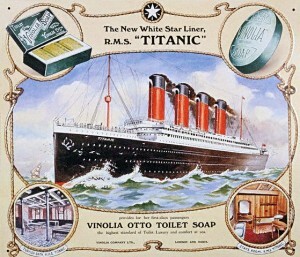 In advertising before its sinking, Vinolia soap advertised it was being used on Titanic. In the movie A Night To Remember, Lightoller pokes fun at the advertising in the rail car scene at the beginning of the movie (in fact the actor had a reproduction of the ad he was looking at for the scene). The Vinolia Soap Works were once located in Bebington, UK , which is where a Unilever building stands today. It was a pricey soap back then costing 35 cents a bar so only people with money to spend could afford it. It was advertised as a cold cream bath soap that had “both antiseptic and antibacterial thanks to the boracic creams used in the recipe.” Vinolia was the only product given permission to advertise its connection to Titanic before the maiden voyage. The company itself was bought in the 1900’s by Lever Brothers and now part of Unilever. You can still buy the soap today but packaging may vary. At the Vermont Country Store, two bars sell for $16.00 and come in standard packaging bearing the name Vinolia. Sometimes it is packaged to show its Titanic connection such as on Amazon. As far as I can tell, they are the same product just different packaging (and prices do vary so shop accordingly). 4. 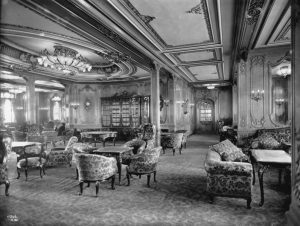 Denise Sheldon writes in The News Herald about how the first class ate on Titanic. They ate very well as many already know. She notes the excellent book, Last Dinner on the Titanic(Rick Archbold and Dana McCauley), as part of her article on the subject. She mentions something that does not get a lot of mention when discussing food and that its preparation was nearly all done by hand. Although Titanic had the best cooking facilities at the time, it required a huge staff to do all the prep work needed for every meal. Remember there were no food processors back then, blenders, standing mixers etc. Which meant you had to hand chop just about everything. Now that does not mean they were without any labor saving devices. They had food mills (hand cranked like the one I have to put my cooked potatoes through to make mashed potatoes), sieves, ovens, toaster racks etc. Just lower tech than what he are used to today. Today when we have tons of veggies to dice up for a crowd, we use a food processor. Back then you had teams of people to do all that chopping for every meal. At any rate Sheldon also finds a recipe, adapted for our time, with Chicken Lyonnaise. I do add a small caveat to it. I would recommend using real chicken stock rather than a broth, which are usually insipid for recipes like this. Swanson’s does have a highly rated chicken stock (highly rated by Cook’s Illustrated) or simply make your own. 5. The Titanic Hotel at Stanley Dock in Liverpool (not to be confused with Albion House, former home of White Star Line that is being converted into a hotel by Signature Living) is set to open in June. According to Bay Tv Liverpool:”The highly-anticipated hotel launch at Stanley Dock, Liverpool will be the first of a multi-staged redevelopment at Stanley Dock Village, which will transform the former Tobacco and South Warehouses, into an innovative residential, business, retail, educational and leisure complex.” The name Titanic Hotel is meant to concrete its connection to Titanic Centre in Belfast. 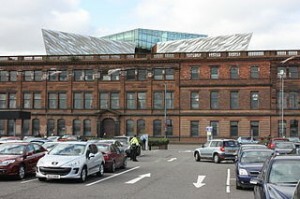 While the development is certainly a positive, it certainly will be confusing to have two Titanic hotels in Liverpool. One at the old offices of the White Star Line and the other at Stanley Dock. Then again they city probably can handle two hotels centered around Titanic but it means tourists will have to be keen on which one they will want to visit.